The structure of the tower was designed with large column-free floor places and includes both reinforced and post-tensioned (PT) concrete, encapsulated in an aluminium and glass facade. CCL provided the post-tensioning, and designed, supplied and installed its PT XF20 and XF30 systems, from basement two to level 58. 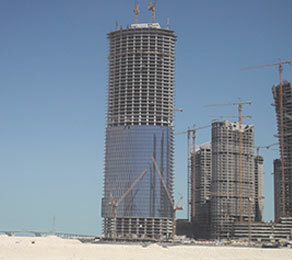 The tower area consists of reinforced slabs, with PT beams connecting the core walls to the edge columns in order to accommodate the large spans, which are a key feature of the structure. The external podium area is made up of PT slabs and PT beams. As the project progressed, a need to reduce the construction schedule was identified. In response to this, CCL’s site team was increased to ensure the schedule requirements could be met.